Father Christmas enterprises today announced that it will no longer use shiny wrapping paper for its Christmas presents. The move is to ensure that all festive wrapping paper used by the Real Santa Clause is fully recyclable. Father Christmas (aged 1,748 years) is not new to leading the way on environmental issues. His reindeer powered sleigh first appeared in 1823 and is so efficient he saw no need to change to coal, petrol or electric power. The Grinch was unavailable for comment. If you are unsure if the paper you have bought can be recycled, give it the “scrunch” test. Take a reasonable size sheet of the wrapping paper (say at least 1ft x 1ft) and scrunch it up into a ball. 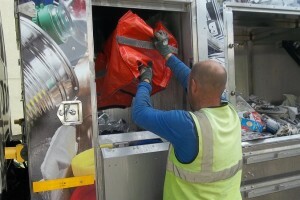 If it bounces back out it will have a large portion of plastic in it and cannot be recycled. If it stays roughly the same shape as when scrunched it can be recycled.